It's now time for big changes. Every day Russian people wake up and see this called sun. Now we can see only a round shape, but before the sharp light of the sun could harm us if we look at it. Now the smog is surrounding us more and more day by day and we ARE guilty of this. 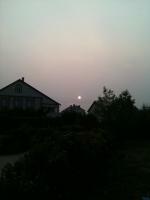 As it s said in news huge fires still do not stop in central Russia and we CAN feel it. While the majors are having vacations in Italy and Spain the earth is suffering. The life is suffering. Volunteers can not get an access to fire spots even if they want to-government don't even give us a chance to do something about our lives and environment.